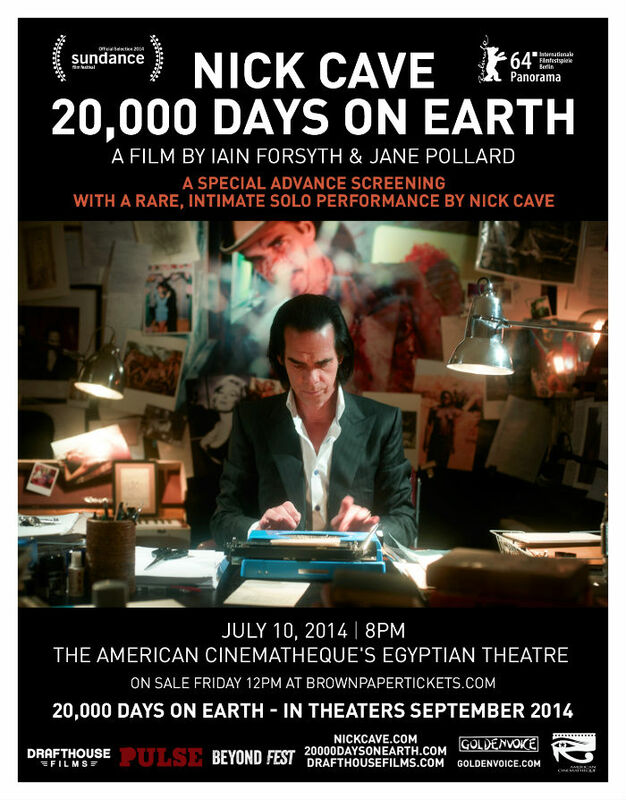 NZIFF 2014 Rockumentaries part 1; Nick Cave’s 20,000 Days On Earth | Shut Up Hamish! I saw three varied rock documentaries at the NZ International Film Festival in Auckland, the first of which, Nick Cave’s 20,000 Days On Earth (directed by Iain Forsyth and Jane Pollard), the most cinematic and staged of all three. There was a bit of hype surrounding this one, to which I was largely ignorant of considering I’m not the biggest Nick Cave fan. I like his music, but have never really delved further than his most popular albums (Murder Ballads, last year’s Push The Sky Away). I’ve gained more of an appreciation for him recently due to his live shows, having seen a few streamed from festivals the last couple of years. His most recent Glastonbury performance was brilliant and enough to convert a non-fan, check it out. 20,000 Days On Earth looks at a fictional 24 hours in the life of Nick Cave, on his twenty thousandth day on earth. An extremely well filmed day and productive day, we see him rehearse and song write with his band and have some hilarious nostalgic conversations with Bad Seeds member Warren Ellis. The band scenes eventually culminate in a riveting performance at the Sydney Opera house, the cinematography focusing just as much on the reaction of the audience members as the charisma of Cave on stage. This being his film, Cave dominates every scene and lets us into his life in a very deliberate kind of way. He takes us on a trip to his therapist, and with a lot of mood lighting as the camera shifts about (possibly on a dolly), Cave gives insight into his childhood, what he remembers of his father and his stints with religion and addiction (addiction jokingly said to be preferable to religion). Cave also takes meandering drives around Brighton which he now calls home, and is joined by people from his past who float in and out, bringing up key moments from Cave’s life and asking questions. Kylie Minogue’s cameo is a particularly notable one as is one of his ex-Bad Seeds members Blixa Bargeld, who discusses his reason for leaving the band. The overall mood of the film is of inspiration, spending much time looking at the creative process behind Cave writing his songs and the influence of the past on his work. I left feeling quite inspired. Although it’s all about Cave, through several monologues he connects to larger themes of the benefits of living a life for art. Cave seems to want to inspire us to be productive, to be more adventurous with our ideas. I feel any creative type will benefit from a trip into an artist’s world such as this. playing was better, and I had an outlet for songwriting and producing, which hhad nothing to do with her, so it was a healthy balance between the two. to keep your studio organized and neat. It is the most commonly made mistake you definitely want to avoid. So colors in the flowers, the dress, accessories etc. a wedding and reception photographer.